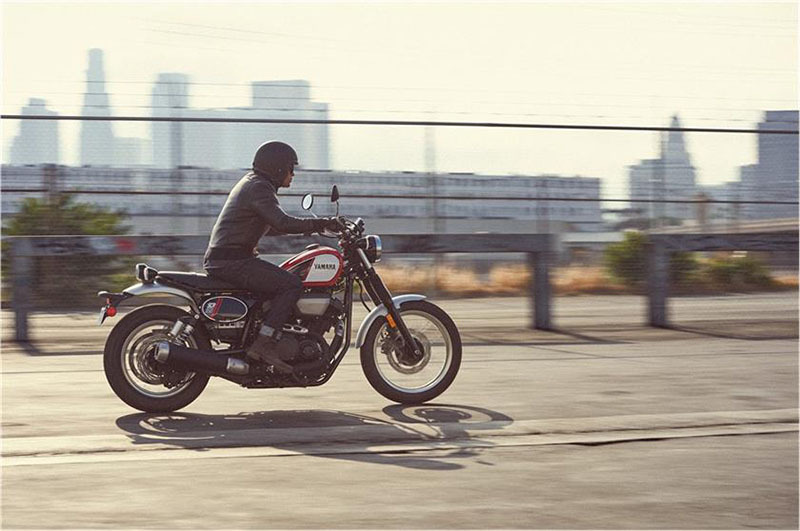 •	CLASSIC SCRAMBLER STYLING: The SCR950 calls back to the past with its low-profile bench seat, retro-racing side number plates, fork boots and bold color accents. 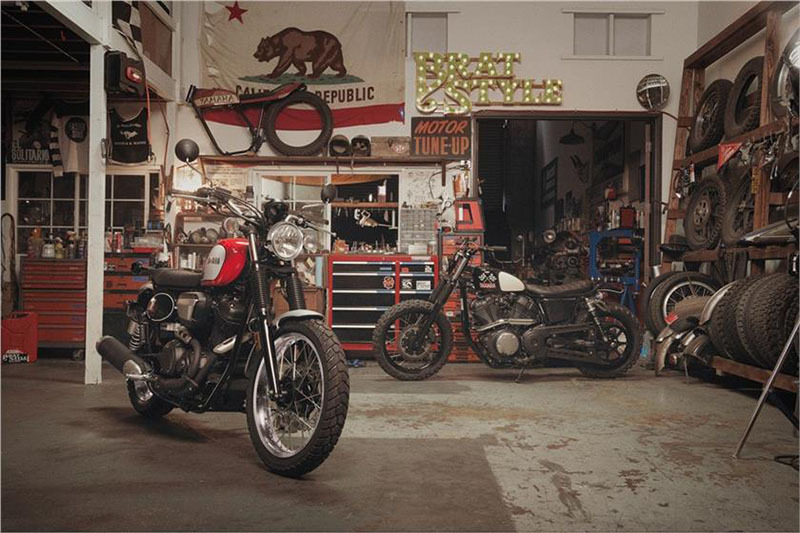 Modern engineering meets timeless scrambler style. •	MODERN LIGHTING: LED rear taillight looks cool and adds to the stylish “neo-retro” appeal. 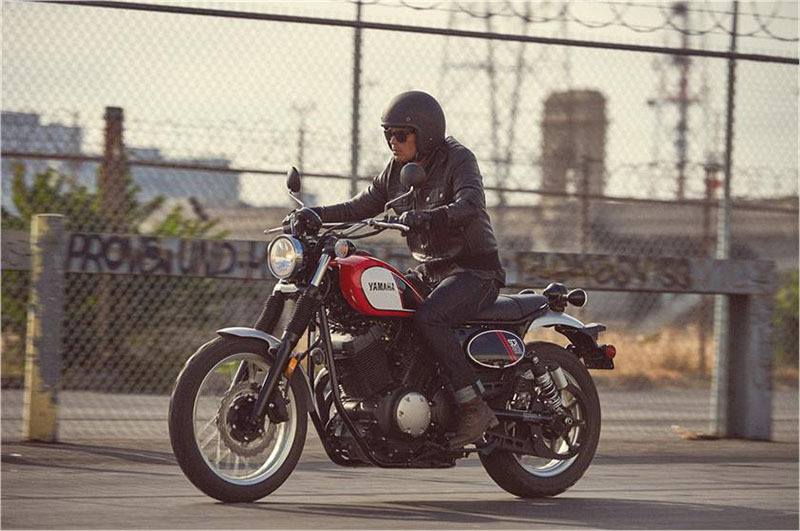 High-mounted turn signals improve visibility and boost the classic styling lines. 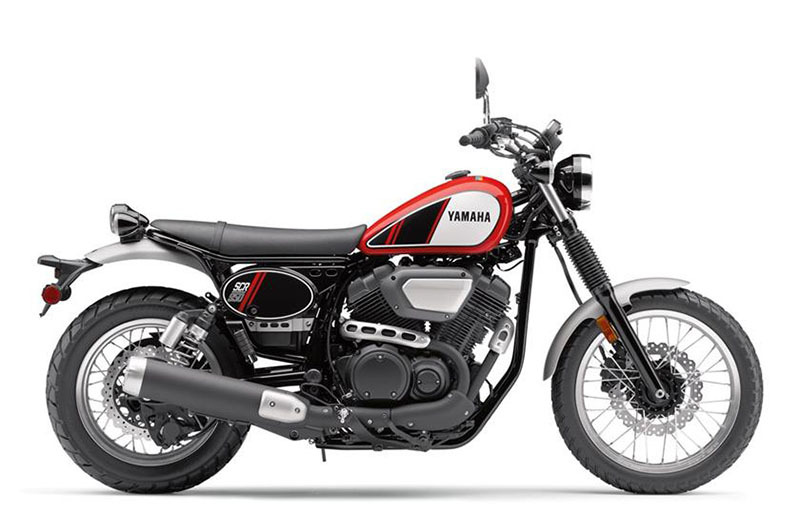 •	CLEAN DETAILING AND REAL STEEL FENDERS: Steel front and rear fenders are ideal for personalization, including paint and customization, while a flangeless fuel tank design displays Yamaha’s attention to detail and clean design. 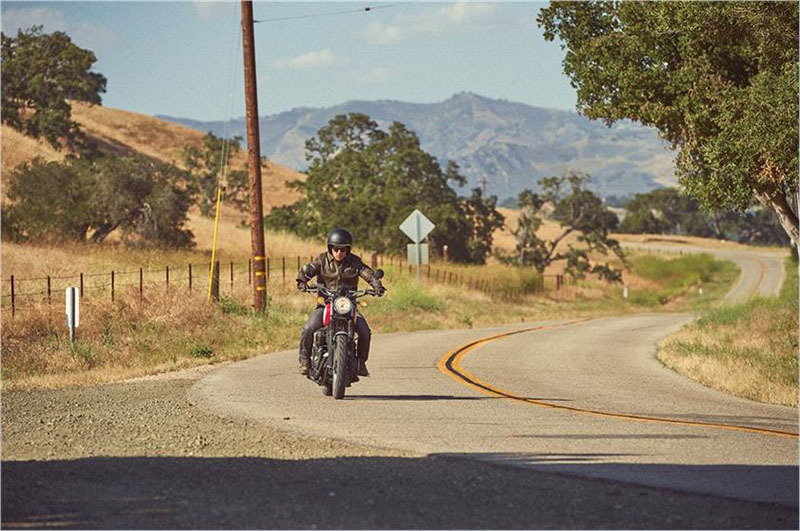 •	INVITING, FLEXIBLE ERGONOMICS: The SCR950 puts the rider in a position of control to handle whatever the road throws at them. A wide and tall crossbar-type handlebar creates light steering feel, while centrally-mounted footpegs and a long, flat seat allows the rider to move easily to adapt to different riding styles. •	HANDLING-FOCUSED FRAME: A double-cradle frame enhances city riding enjoyment thanks to an engine mounted to the frame with a rigid mount system that provides precise handling. •	ADVANCED SUSPENSION: The beefy front 41mm fork tubes offer excellent suspension performance across a wide range of surfaces. 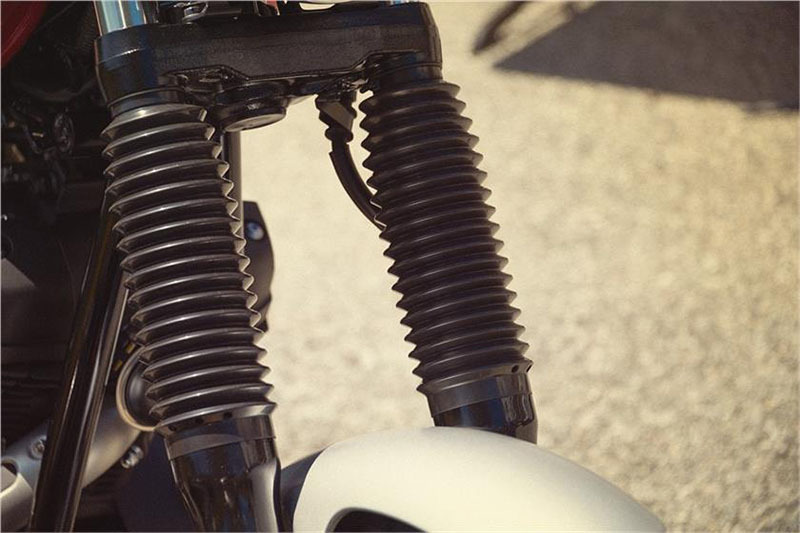 The twin rear shocks—which include piggyback-style gas chambers—have been tuned to provide great comfort and handling while contributing to the machine’s stylish low profile. •	LOW MAINTENANCE BELT DRIVE: A compact belt drive contributes to the slim and clean look of the rear end. The belt has a carbon-fiber core which adds strength for long-lasting durability. •	POWERFUL BRAKING: The 298mm front disc brake and 298mm rear disc brake both use wave rotors, the style usually found on sport bikes. The front brake uses a floating-mount for great heat-distortion resistance, contributing to excellent braking performance. 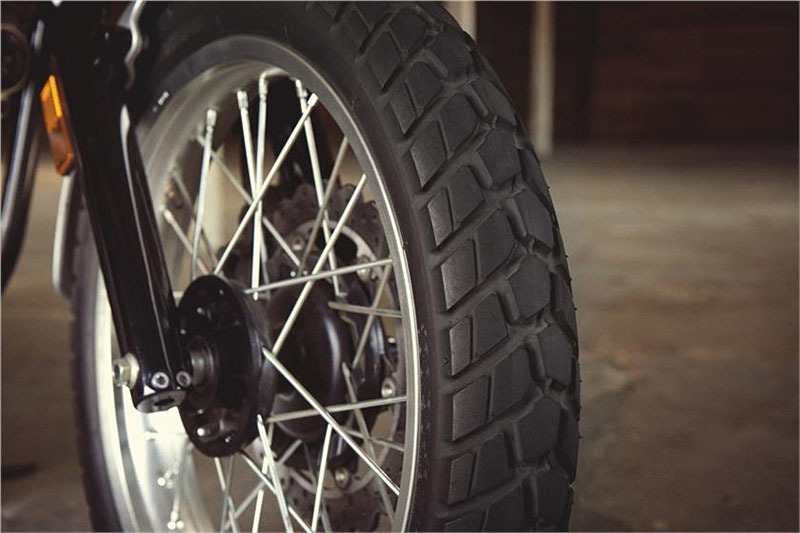 •	DURABLE SPOKED WHEELS AND TIRES: Strong aluminum rims and spoked wheels are ready to handle harsh road conditions, while rugged, block-pattern 19-inch front and 17-inch rear tires provide an ideal balance of grip, durability and agile handling. 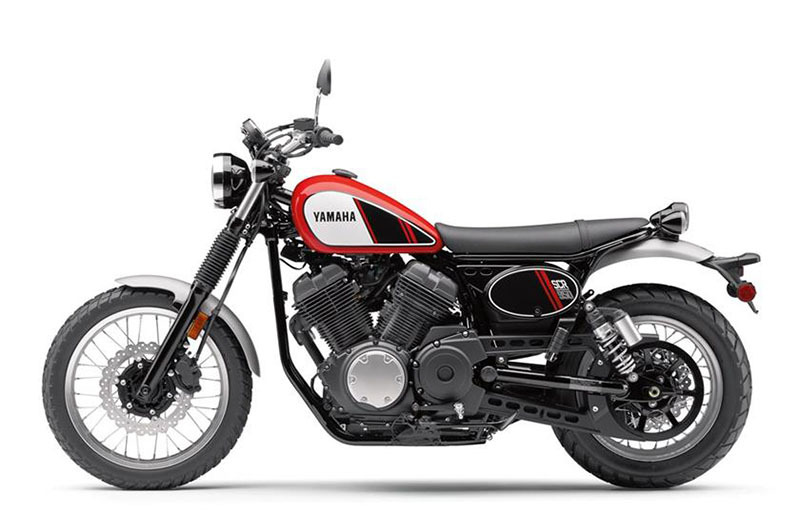 •	MODERN AIR-COOLED V-TWIN: The SCR950‘s 58-cubic-inch (942cc) engine is an air-cooled SOHC 60° V-twin with four valves per cylinder, a pent-roof-shaped combustion chamber, and 9.0:1 compression ratio. 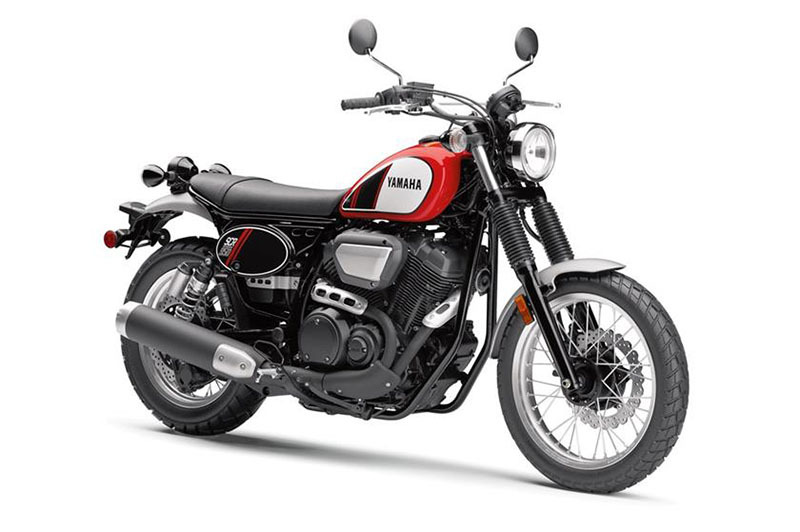 The engine is designed to provide strong power and superior low-end torque, ideal for exploring roads off the beaten track and powering out of tight corners. •	ADVANCAED CYLINDER DESIGN: The pent-roof combustion chamber shape was precisely engineered to direct the fuel/air charge to the center of the piston for more efficient combustion and maximum power. Ceramic-composite plated cylinders provide excellent heat dissipation and reduced oil consumption, while forged aluminum pistons use a lightweight and high-strength design that contributes to reduced vibration. •	LOW FRICTION INTERNALS: To keep friction loss to a minimum, increase durability and help the engine achieve the ideal performance characteristics, special roller-type rocker arms with needle bearings are used. •	FUEL INJECTION: Sophisticated twin bore fuel injection is used on the SCR to deliver excellent throttle response. 3D maps for ignition timing and fuel injection deliver outstanding acceleration in the mid- and low-speed ranges. 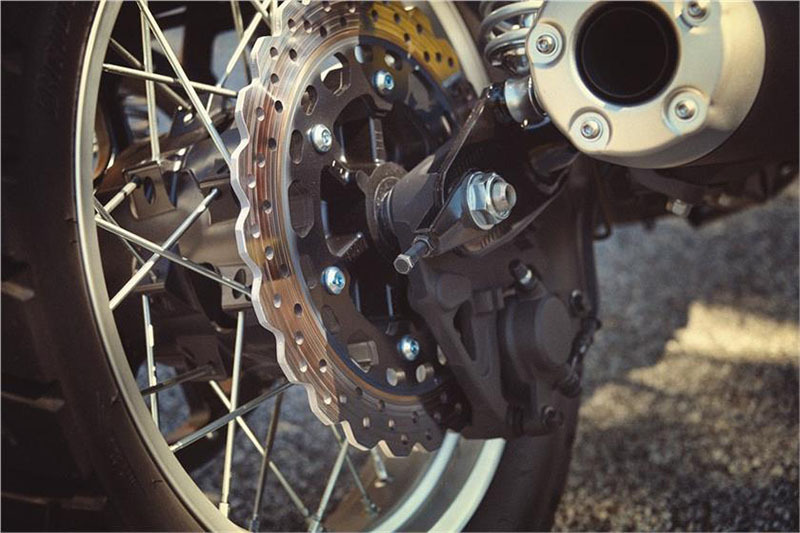 •	SMOOTH SHIFTING 5-SPEED TRANSMISSION: The SCR950’s wet multiplate clutch system uses a rubber damper to absorb shocks and smoothly transfer power, while a wide-ratio five-speed transmission makes the most of the torque of the big V-twin to provide both relaxed gear ratios and plenty of thrust on demand. •	COMPACT AIR CLEANER: The stainless steel air cleaner cover provides a “raw metal” look that accentuates the SCR950’s distinctive styling. In addition, the air cleaner design provides great intake efficiency and enhanced torque characteristics. •	UNIQUE UPSWEPT EXHAUST SYSTEM: A 2-into-1 exhaust pipe layout on the right side of the engine contributes to the lively performance and styling of the machine, with an upswept muffler for improved ground clearance. The minimalist-style exhaust system delivers a throaty and pleasing exhaust note. 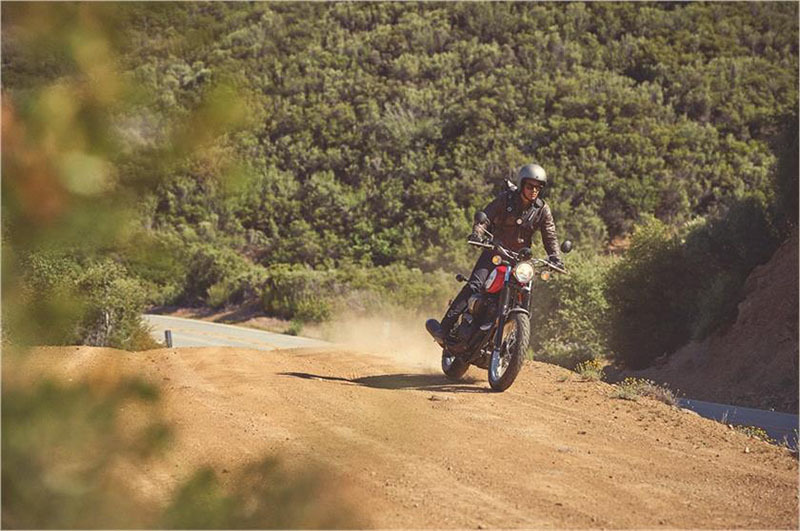 •	CLASSIC SCRAMBLER STYLING: The SCR950™ calls back to the past with its low-profile bench seat, retro-racing side number plates, fork boots and bold color accents. 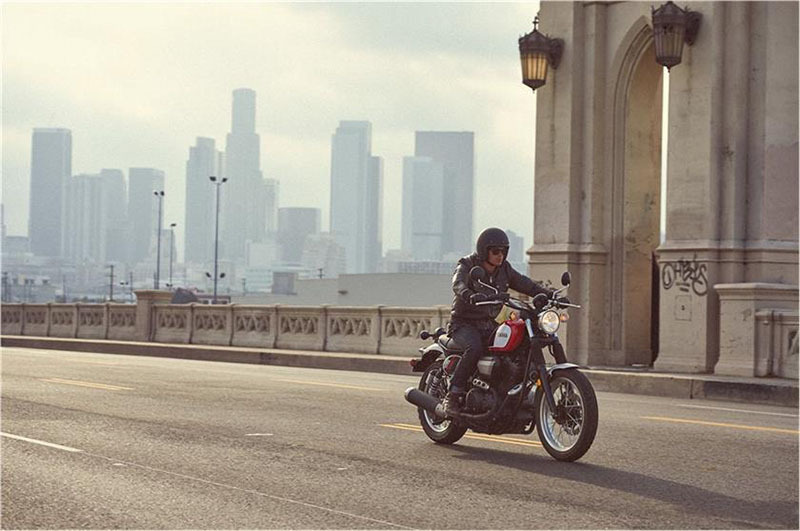 Modern engineering meets timeless scrambler style. 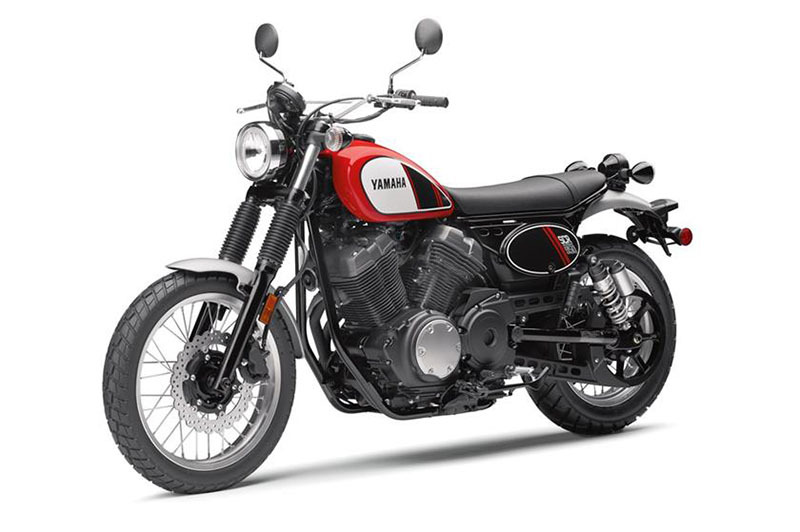 •	MODERN AIR-COOLED V-TWIN: The 58-cubic-inch (942cc) engine is an air-cooled SOHC 60° V-twin with four valves per cylinder, a pent-roof-shaped combustion chamber, and 9.0:1 compression ratio. 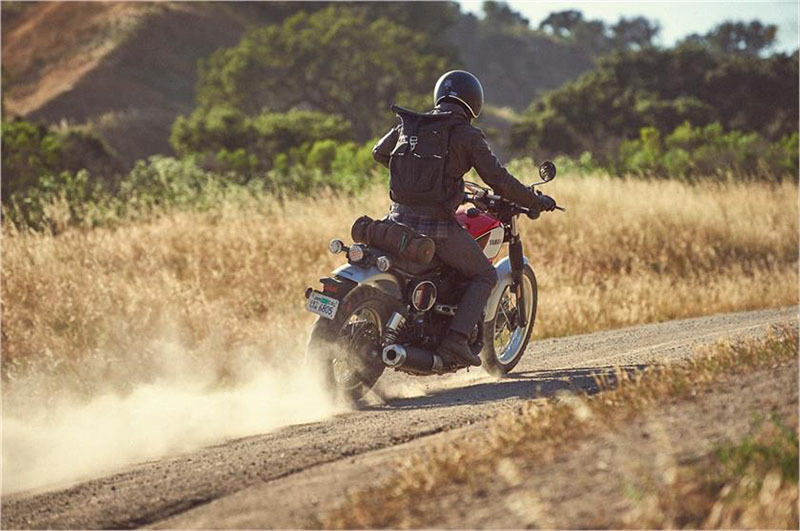 The engine is ideal for exploring unpaved roads off the beaten track and powering out of tight corners. •	UNIQUE UPSWEPT EXHAUST SYSTEM: A 2-into-1 exhaust pipe layout on the right side of the engine contributes to the lively performance and styling of the machine, with an upswept muffler for improved ground clearance and a pleasing exhaust note. 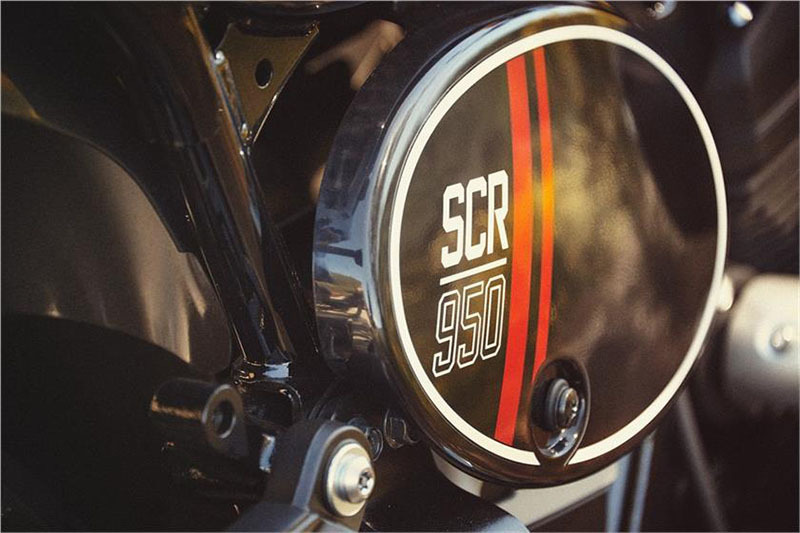 •	INVITING, FLEXIBLE ERGONOMICS: The SCR950 puts the rider in a position of control to handle whatever the road throws at them. A wide and tall crossbar-type handlebar creates light steering feel, while centrally-mounted footpegs and a long, flat seat allow the rider to move easily to adapt to different riding styles. •	HANDLING-FOCUSED CHASSIS: A double-cradle frame features sporty geometry for nimble, responsive handling in any environment. The front and rear suspension systems are tuned to provide great comfort and handling while contributing to the machine’s stylish low profile. 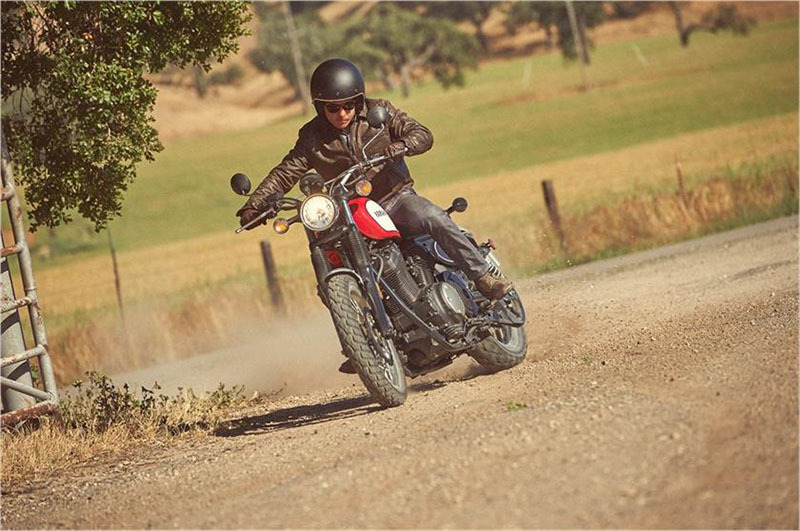 All-new SCR950 combines vintage, scrambler styling with modern engineering. Potent 942cc V-Twin, spoke wheels, high rear fender. Advanced Cylinder Design: The pent-roof combustion chamber shape was precisely engineered to direct the fuel/air charge to the center of the piston for more efficient combustion and maximum power. Ceramic-composite plated cylinders provide excellent heat dissipation and reduced oil consumption, while forged aluminum pistons use a lightweight and high-strength design that contributes to reduced vibration. Handling-Focused Frame: A double-cradle frame features sporty geometry for nimble, responsive handling in any environment. The engine is mounted to the frame with a rigid mount system that provides excellent feedback to the rider. L x W x H: 88.6 in. x 35.2 in. x 45.9 in. Rake (Caster Angle): 28.4 deg.